During the spring of 1728, two brothers, Theobald and Jacob Mechling left their home in Germany and made their way to Rotterdam Holland. Once there they boarded the ship James Goodwill and sailed to Deal England. On June 25, 1728 the Mechling brothers joined thirty six other families headed to the port of Philadelphia. 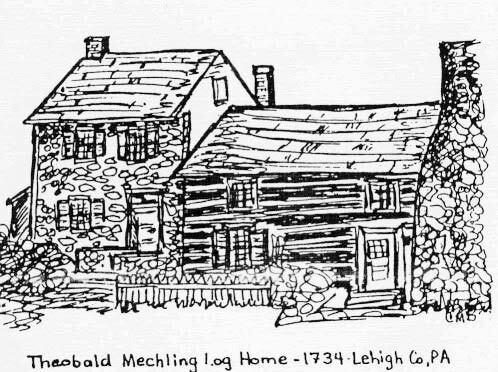 Three months later on September 11, 1728 Theobald and Jacob Mechling arrived in Philadelphia. Upon landing they went before the Provincial Council where they signed a declaration of allegiance to King George II of England.Theobald and Jacob went to Germantown, then on the outskirts of Philadelphia, where they engaged in the tannery business for a few years. There is speculation there may have been a sibling or other realtive already in Germantown who owned the tannery. It was not an easy job. “Leather, for example, essential for harness, shoes and boots, belts for machinery, and many other products, was produced locally. The manufacture of leather was a complicated business, involving hard work and a series of – often malodorous – processes. First raw hides were carefully scraped on a fleshing beam to eliminate all traces of fat and flesh, then soaked for several days in a caustic lime solution to remove the hair or fur. After flushing with clean water (in the nearby creek), the hide was pickled, or tanned, by steeping it in a strong solution of ground oak or hemlock bark containing tannin.” From Waterford History website. Within a few years, Theobald married Anna Lauer, daughter of John Peter and Anna Margaret Lauer. In 1731 he obtained a grant of 125 acres in Bucks County, PA. from Thomas and Richard Penn, sons of William Penn. Theobald continued to obtained parcels of land for several years. 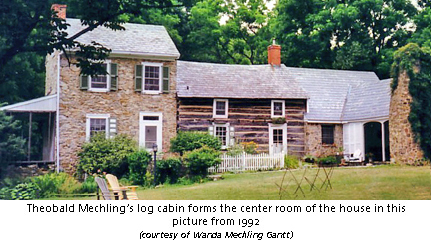 Theobald built a log cabin on his land, which is still standing as part of a larger house in what is now Zionsville PA. There is an organization, The Mechling Family Association, that is working to get the house back into the family as part of the Association. On 19 September 1763, Theobald wrote his will leaving his beloved wife, Anna (Elizabeth) Mechling one complete Bed stead with all the furniture, one cow, one side saddle worth three pounds and ten shillings, one chest, one spinning wheel, two iron pots, all the flax which is not spun into yarn at my decease and two butter dishes, three plates, six spoons, one tea pot, two bureaus of which one is pine. He had already given some of the children 100 pounds each and the others were to receive 100 pounds each when they became of age. He left the plantation of 170 acres to the youngest son, Thomas with the agreement that Elizabeth could remain at the home and share in the profit of the plantation as long as she remain a widow. The plantation was valued at 400 pounds. Thomas was to take possession when he became twenty one years of age. He was to pay the other four brothers and one sister twenty five pounds each year until he had paid each one 1/6 of the 400 pounds. Theobald died in April 1765. 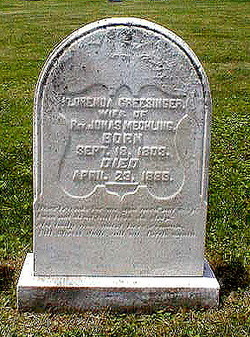 He and his wife are buried at the cemetery at Dillingersville by the Upper Milford Lutheran Church. Anna Elizabeth and Theobald had eight children. We will follow the Mechling family line through Philip Mechling born 1749. On the June 11, 1770 in the Zion Lutheran Church in Northampton County, Philip married Katherine Wetzel. He died in York County on November 11, 1817. By occupation, Philip was a tanner. Philip and Katherine’s son Philip Jonas was born Nov. 4, 1774 in Northampton Co. Pa. He married Catherine Coder about 1795 in Hempfield Township in Westmoreland County. He died in Westmoreland County, PA on Aug. 19, 1847 and is buried in the Old Union Graveyard in Greensburg. Philip was listed on census records as occupation – mason. There is not a lot of information available on Philip or his son Philip Jonas. Philip and Catherine’s son was Jonas (Jonathan) Mechling. Jonas was born 14 Aug. 1798, died 2 April 1868 & is buried at the Old German Cemetery in Greensburg. He married Florinds Gressinger. He was a Lutheran minister & traveled widely throughout Westmoreland County as a missionary pastor. “In the spring of 1849, Rev. Jonas Mechling was called to be pastor. He labored here until his death in 1868. Rev. 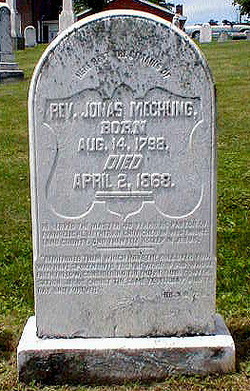 Jonas Mechling, son of Philip Mechling, was born in Hempfie1d Township, Westmoreland County, on the 14th of August 1798. He was baptized in infancy by Rev. Wm. Weber, and confirmed by pastor John M. Steck. He received his early education in the church schools of Westmoreland County and studied theology under Rev. J. Schnee of Pitts burg and Rev. John M. Steck. He was licensed to preach by the Evangelical Lutheran Synod of Ohio on September 19th, 1820. He then took charge of a number of congregations of Father Steck’s parish; St. James and Hankeys, Hope, Zion’s and St. John’s and the Churches of Ligonier Valley. Later he served St. Paul’s Ridge St. James, Youngstown, and Christ Church West Newton. Upon the death of Father Steck he was called to the Herold-Greensburg parish, which consisted then of the following congregations: Herold’s, Brush-Creek, Greensburg, Manor, Hill’s and several other preaching sta tions. He also preached in the Churches on this side of the Ridge until 1855. He died on the 2nd day of April, 1868 in the 70th year of his age and the 48th of his ministry. Jonas and Florinda had eleven children. Next in the Howlett family tree is William H Mechling. He was born in 1827 in Pennsylvania. In the census reports he is listed as a “Hotel Keeper” and “Wholesale Liquor Distributor”. He married Emma (Emmeline) Clark, daughter of Ashbel Clark and Mary Weller. William and Emma’s son was Herman Clark Mechling. We will continue this story on a soon to come post! Stay tuned!